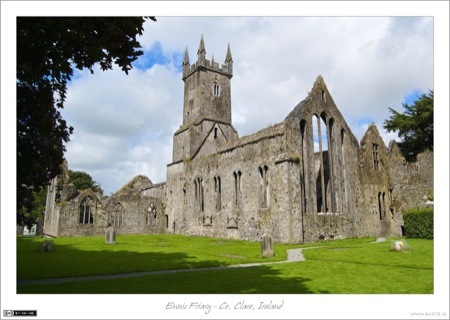 This week’s photo of the week was taken the summer before last when I was in Ennis for a friend’s wedding. I didn’t have much time for sight-seeing on my visit, but myself and another friend did find a half hour to go pay a visit to the ruins of the old Friary in the town. We didn’t have much luck with the weather though, it was generally cloudy, and we spent quite some time sheltering from the rain within the ruins! Just as we were about to head for the exit the sun burst through very briefly, and I managed to get off a few shots in good light, including this one. You can see the full set of shots from my visit on Flickr. 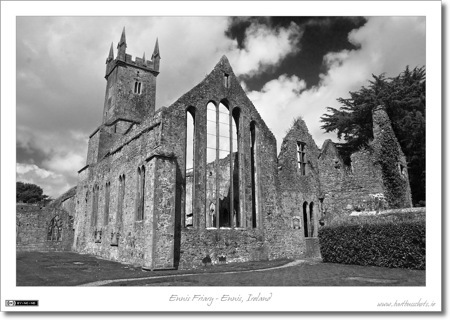 I don’t do many black & white conversions, but for some reason Ennis Friary seemed to lend itself to them very well. I guess old church buildings just work in monochrome! This week’s Photo of the Week is one from a set taken on the 1st of August this year when I was in Ennis for a friend’s wedding. Wide angle lenses cause distortion which makes parallel lines not look parallel, this generally takes away from images of buildings. However, in this image the distortion actually adds to the shot because of the angle of the camera relative to the building. We’re not looking at the building face-on, but instead corner-on. The building is still distorted, but rather than being off-putting the distortion works to make the building look more imposing. The easiest way to make a colour image black & white is to simply desaturate it. This almost never gives a nice image. The output tends to be bland, flat, and boring. If you want to get a better conversion you need to use a channel mixer. This allows you to control the levels of each colour that are used to create the final monochrome image. You can spend hours tweaking with the mixer, but when it works, it can give very striking images. In this case I used the mixer to take out the blue channel entirely, this turned the blue sky the dramatic black colour you see here. I also turned the green channel down a bit to darken the grass a little. Finally, the red channel was boosted to make up for the reduction in light from reducing both the blue and green channels. This had the effect of brightening the building relative to the grass and sky so it stands out. Processing: The image was converted to monochrome using the Channel Mixer, and then the contrast in the building was selectively increased using the Dodge & burn plugin in Aperture. This is my 67th Photo of the Week, yet it is only the second monochrome image to make it into the series. I think this is because I absolutely adore colour, and feel rather out of my depth when colour gets extracted from the equation. It took me hours to process this shot the first time, then I got some feed back from people on a few flickr groups, and then it took me another hour or so to have another go and come up with something I not just liked, but liked a lot. Most of the time I only revert to monochrome as a fall-back, but I’m going to try change that, and spend more time experimenting with monochrome precisely because I’m not comfortable with it. Returning to this image, I reverted to monochrome here because I didn’t have a choice. 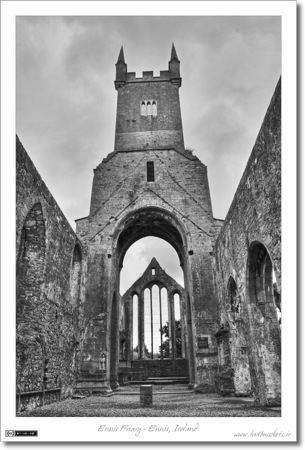 I had once chance to get a short visit to the priory, so I had to make do with what ever I got – which was mostly rain! At the very end I got a few shots in good sun, but I didn’t have the opportunity to re-shoot this shot in sun because of time pressures. 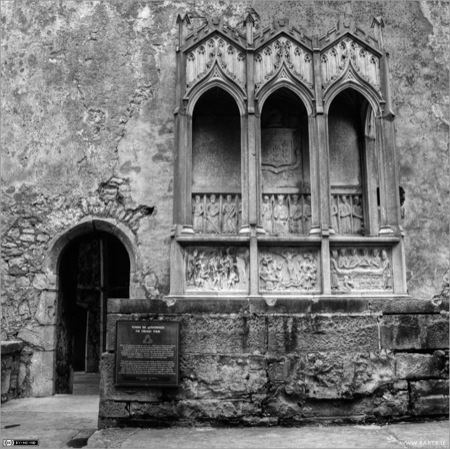 So, what I got was an image with a blown out sky, a flat looking stone building, and almost no colours to speak of. I was either going to bin it, or go monochrome. Determined not to waste the shot, I went for the monochrome option – deciding texture was going to be what I needed to concentrate on – in particular, I wanted to recover details in the sky, and enhance the details in the stonework of the building. Since I’d shot in RAW I started by tone-mapping the image to recover detail in the sky, and also to enhance details in walls. Then I converted to monochrome using the monochrome mixer in Aperture, before using Aperture’s dodge & burn plug-in to correct some side effects of the tone-mapping and to pick out the spire of the church a little better. After seeking and getting some opinions from others I also used some pretty dramatic levels adjustments to really push up the contrast and really make those textures jump out. Processing: Generated by tonemapping a single RAW file in Photomatix Pro, then converting to monochrome in Aperture, dodging & burning in Aperture, as well as applying some other tweaks in Aperture.